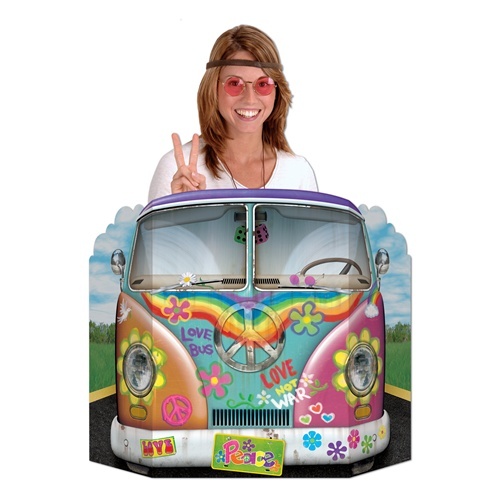 60s Hippie Theme Party Supplies & Decorations - PartyCheap - We're groovy! The most popular peace sign was developed in 1958 as a symbol to show support for nuclear disarmament. This inverted V with a line through it can be seen in popular culture from art and music. When combined with rainbow colors it is the most universally recognized symbol for peace. Hang some peace decorations above the heads of your guests with colorful decorations like the Peace Whirls and the Peace Sign Banner. We even have a matching Peace Sign Centerpiece that combines the symbol with tie-died colors. Use peace sign decorations like the Tie-Dyed Peace Sign Party Tape anywhere, including outdoors, as it is made of a durable poly material that won't run or fade. We even have peace decorations you can wear like the Peace Sign Suspenders and the Peace Beads which make for great party favors. Grab a packet of 60's Party Buttons that include a peace button and four other buttons that you can give out to others to share the love. One of the most popular retro icons is the Lava Lamp. We have official Lava Lamp decorations to use in combination with the peace decorations to make a really groovy vibe at your pad. There are even Lava Lamp Dessert Plates and Lava Lamp Lunch Napkins to serve your guests munchies on. 60's retro flowers are also a very popular 60's theme icon. Technically, the term 'retro' is used to describe anything that is old and culturally outdated, but it appears to be very much linked to the 60's with decorations like the retro flowers. The term "Flower Power" came to symbolize non-violent protests and hippies put flowers on just about anything from clothing, to headbands, and some even painted their cars with flowers. We have Retro Flower Cutouts and Retro Flower Hippie Centerpieces that will brighten up your 60's party decorating. 60's theme parties are great for a birthday theme, a retirement party, or even if you want to have a unique prom theme different from everyone else. Whatever the reason for you to throw a 60's theme party, we are sure to have lots of 60's party decorations and tie dye decorations that are sure to make you smile! Browse our full collection so that you will have everything you need! Throw a hippie party for someone who grew up in that era or for someone younger who loves the look and the music of that time. Mellow out dude with hippie Peace Beads and Tie-Dyed Bandannas. Check out all of our Tie-Dyed Party Decorations. Senator John F. Kennedy accepts the Democratic nomination for president on July 15, 1960. NBC cancels Howdy Doody. The last episode airs September 24, 1960. Harper Lee's 1961 book To Kill A Mockingbird is a bestseller. James H. Meredith becomes the first black student to attend the University of Mississippi on October 1, 1962. The Beatles make their U.S. debut on The Ed Sullivan Show, on February 9, 1964. The 9th Marine Expeditionary Brigade arrive in Vietnam on March 8, 1965. Apollo astronauts Virgil Grissom, Edward White, and Roger Chaffee die during a simulated launch exercise on January 27, 1967. John Wayne wins the 1969 Best Actor Oscar for his role in the movie True Grit. Woodstock draws more than 450,000 people to Bethel, NY. in August 1969.